Come on out to Original Sewing & Quilt Expo at the Infinite Energy Center in Atlanta, GA on Thursday, Friday and Saturday, March 7, 8 & 9 for all things Cosplay. 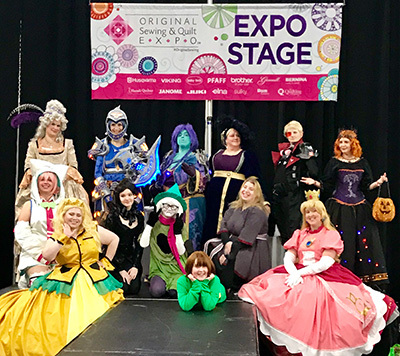 Wear your Cosplay design (or period costume) and walk the runway in the Cosplay Fashion Show on Saturday at 3:00 on the Expo Stage. As a participant, you'll be entered into a drawing to win an Imaginator 3D printer and starter pack of filament from Sew Much Cosplay and RNK! Who is your character and what are they like? Tell us about your process of making the costume. See a selection of costumes from Cheryl Sleboda of Sew Much Cosplay and from the pages of the book Epic Cosplay Costumes by Kristie Good (aka Karmada) on display at the Expo on Thursday, Friday and Saturday. Sign up for classes from Cheryl Sleboda to learn new cosplay costuming techniques. Click on each title below for details and to register. Shopping, shopping, shopping! Experience retail therapy inside the Exhibit Hall where you’ll be surrounded by an incredible selection of machines, tools, fabrics, notions and patterns. Be sure to check out Classic Sewing Booth #619 and Vogue Fabrics Booth #340 for cosplay supplies.